Most of the Peters Creek watershed is underlain with high-quality, easily-mined coal deposits that outcrop on the slopes of many of the stream valleys. The close proximity of these valuable deposits to the many Pittsburgh area coke ovens and steel mills has led to extensive mining throughout the watershed. The Pittsburgh coal bed has been mined since the early 1900’s by underground methods and has resulted in many parts of the watershed being prone to surface subsidence. This is currently a major issue in the Pleasant Hills area. The Redstone coal bed, which overlies the Pittsburgh coal bed, was mined subsequently by surface methods before environmental laws were enacted requiring reclamation of mined lands. The resulting spoil piles have remained largely un-reclaimed and are scattered throughout the watershed. Today, the watershed continues to suffer from its coalmining legacy. Many of the abandoned mine workings have partially flooded with water. Pyrite (FeS2) is a common mineral that is often found in association with coal seams. When the pyrite in these mine voids comes into contact with water and oxygen; acidic mine water often results. This acidic water has a great capacity to dissolve other minerals such as aluminum and phosphorus. 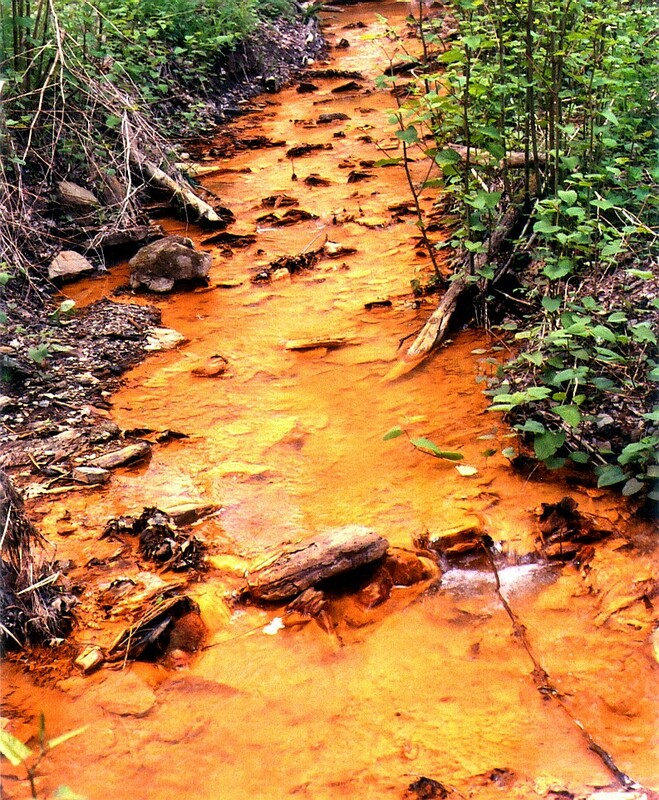 These acidic, mineral-laden waters often find their way into the streams of the watershed and degrade them. The same process occurs when rainwater percolates through pyrite-laden, unreclaimed overburden piles from stripmining activity.